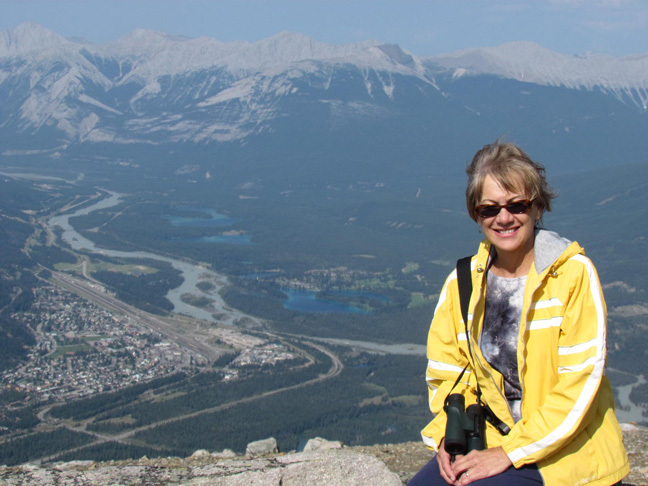 Here Glorine is perched on top of Whistler Mountain overlooking the heart of Jasper National Park. 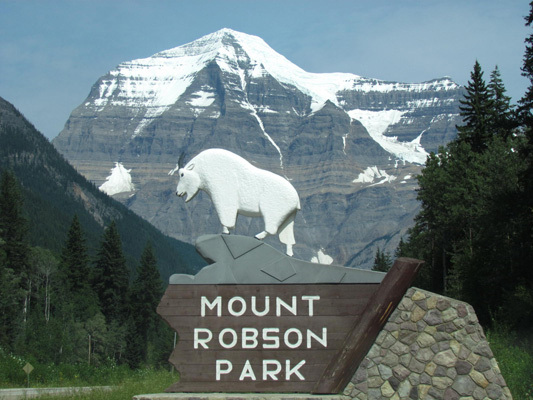 While Banff is the oldest park in Canada, Jasper (about the size of Connecticut) is the largest. 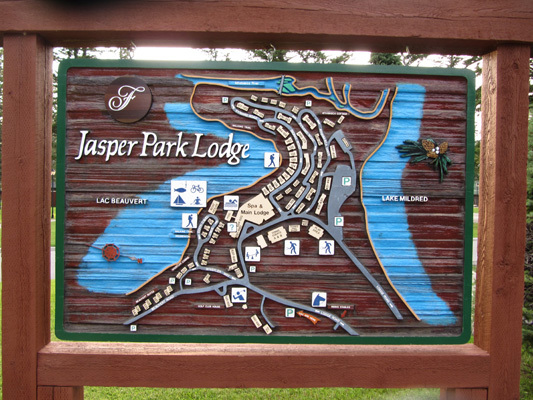 The Jasper town site is in the shape of a "J" and just left of Glorine is the Fairmont Jasper Park Lodge, with the highest ranked golf course in Canada. Millions of years ago the entire area was covered with glaciers, and as they receded, they left a trail of Alpine mountains that look like a moonscape. 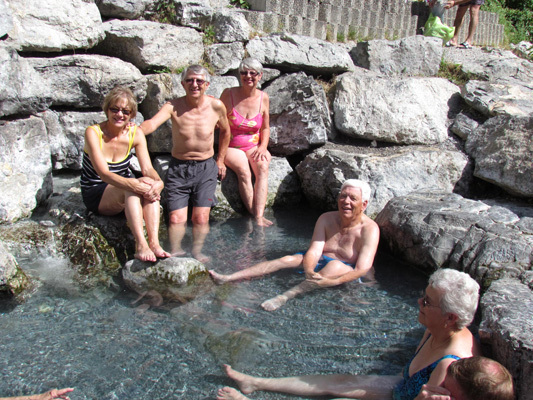 While we were still in Banff, Brain and Marilyn Mitchell, friends from Regina spent a couple of days RVing with us and showed us this natural hot spring. The setting and temperature was perfect. On the way back to Banff, we drove along lakes and rivers that form the head waters of the Columbia River. This river flows through Washington state and eventually drain into the Pacific Ocean. 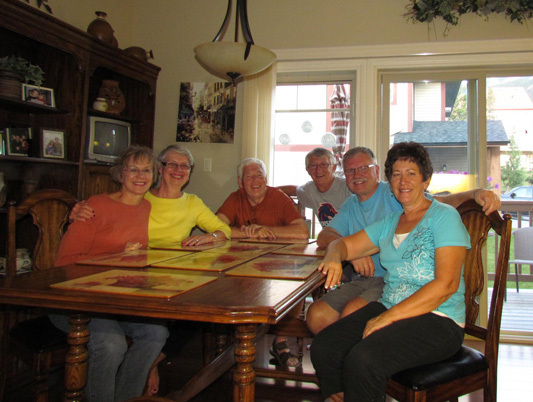 We visited mutual friends we made in Mexico--Clive and Bev Overton. 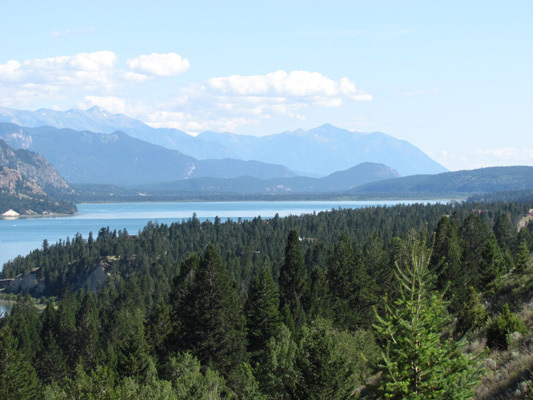 They live in Radium Hot Springs, British Columbia in the summer and winter in Ajijic. Their villa is down the street from the one we rented. 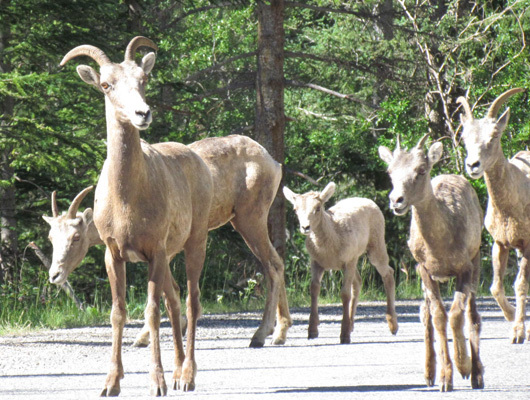 On the way to one of Brian's favorite ski resorts, we ran into a tribe of Rockie Mountain sheep with their young ones. There must have been 20 of them running on the road to greet us. Back to Lake Louise, this time to hike up to Lake Agnes Teahouse. 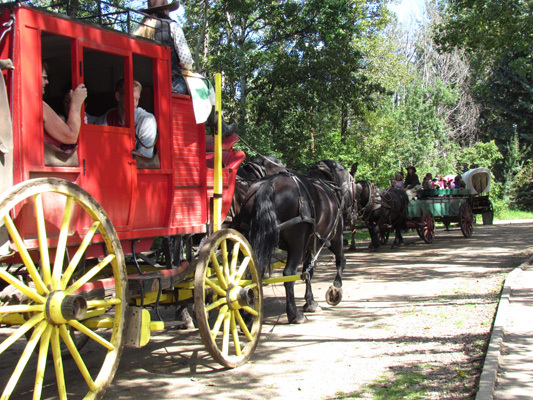 The round trip was only 4-1/2 miles but the elevation is 1,200 feet high. 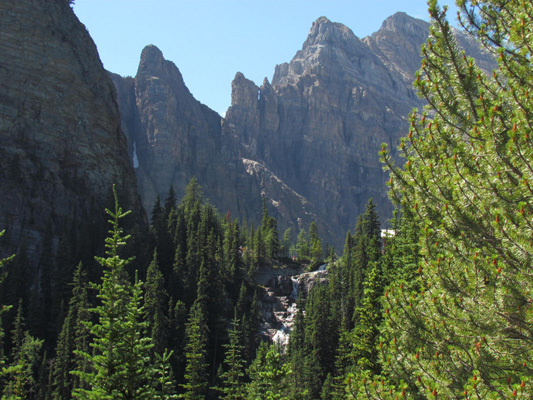 The well groomed trail took us along old-growth forest of spruce and fir and spectacular views of jagged mountain peaks. 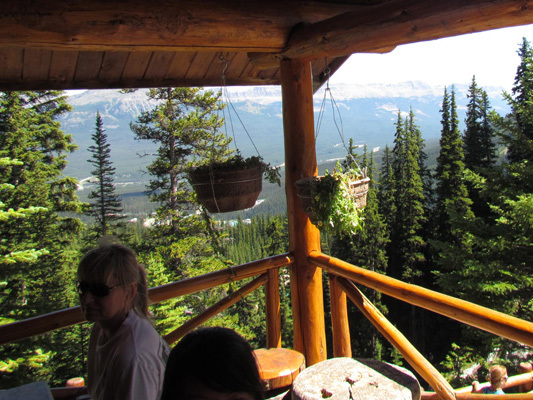 The trail led us to the rustic teahouse where we had soup and sandwiches--just enough energy to get back down to Lake Louise. While we were walking up, we heard sounds of thunder but there were no clouds. 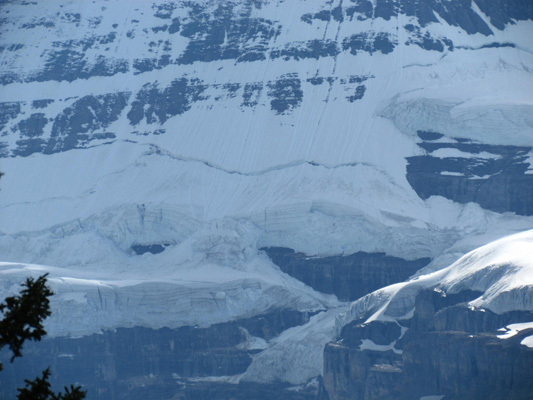 Another hiker told us it was glacier ice cracking and pointed out this example. After a round of drinks, our waitress was kind enough to take our picture with the glaciers of Lake Louise in the background. 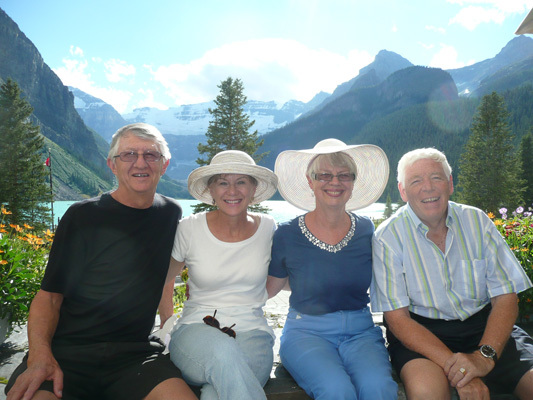 Having said farewell to Brian and Marilyn, we drove the Icefields Parkway to Jasper National Park. After setting up, this deer grazed along our campsite. While Banff and Lake Louise each have eloquent resorts, Jasper's was very rustic with log cabins spread out between two beautiful lakes. After hiking alongside of Mt. 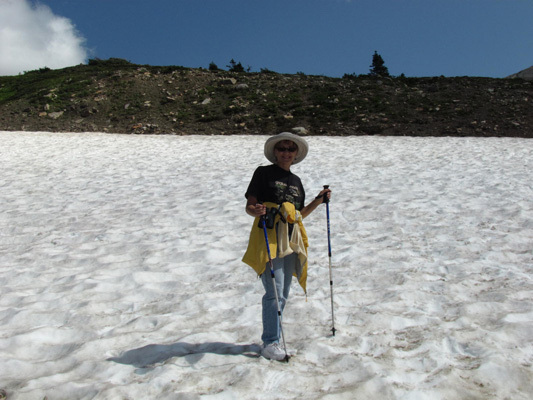 Edith Cavell's 2-1/2 mile hike and up 1,300 feet, we got to this patch of snow left over from last winter. All Glorine needed was her skis. We got a picture with Angel Glacier in the background. It is hard to believe, but this glacier is over a mile away and 100s of feet thick. Near the bottom is a turquoise glacial lake. It was an awesome hike. Before leaving, we saw this avalanche--a piece of Ghost Glacier breaking away. Two days later, most of Ghost Glacier broke off, creating a tsunami which pushed water from the lake and caused severe damage downstream. This area is now closed to the public. 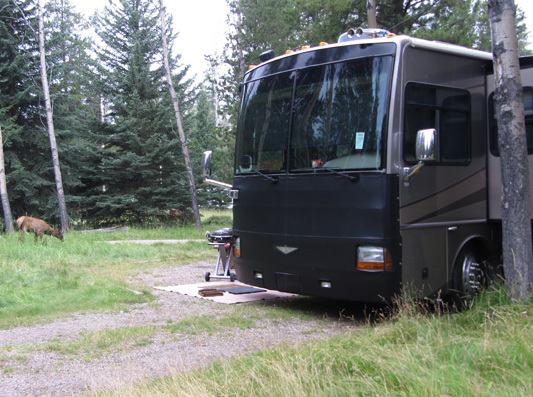 As we prepped for another hike, we saw all these RV rentals. 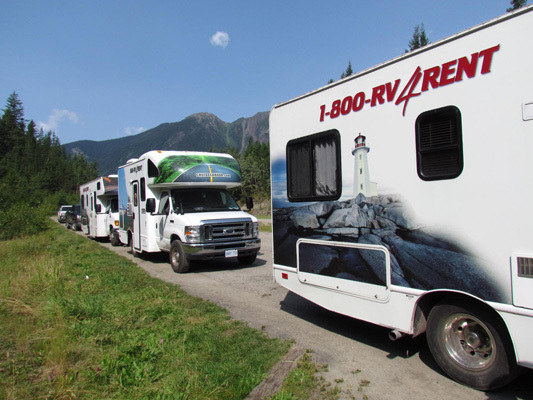 We have seen RV rentals before but not this many. 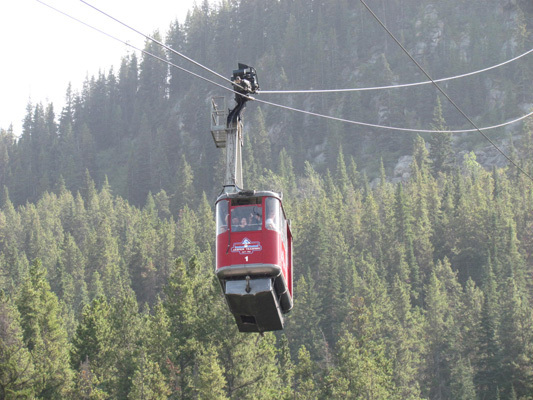 An inexpensive way to explore the Rockies. Fraser River stretches 850 miles from the glacier to the Pacific Ocean. 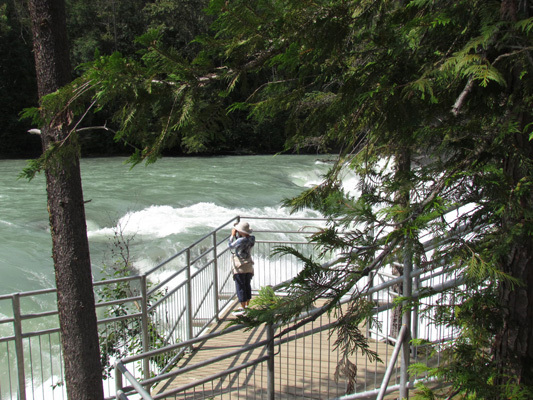 Rearguard Waterfall near Jasper is said to be at the end of the salmon migration. 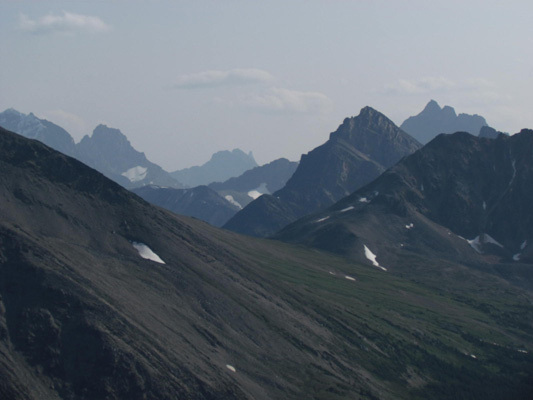 West of Jasper is the most prominent mountain in North America's Rockie Mountain range. 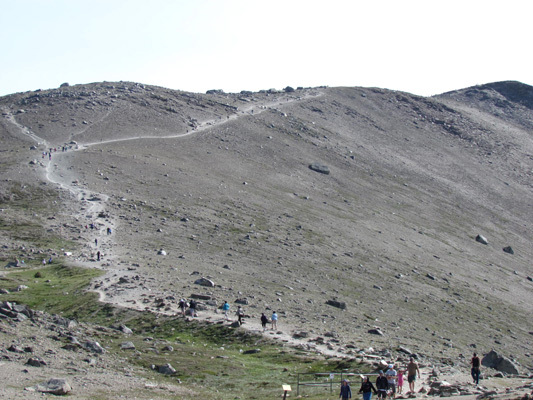 At 12,972 feet it is the highest point in the Canadian Rockies. 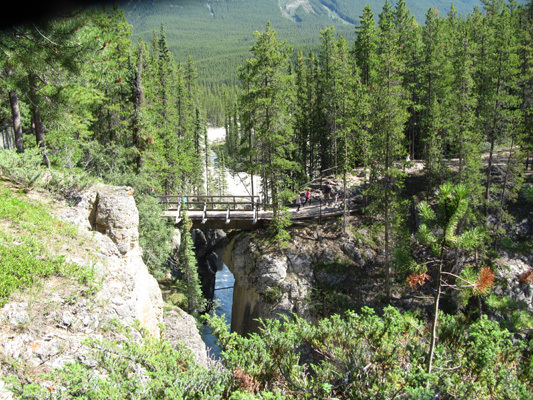 Parks Canada did a great job setting up trails for tourists to get close to this spectacular scenery including this walking bridge over Sunwapta Falls. 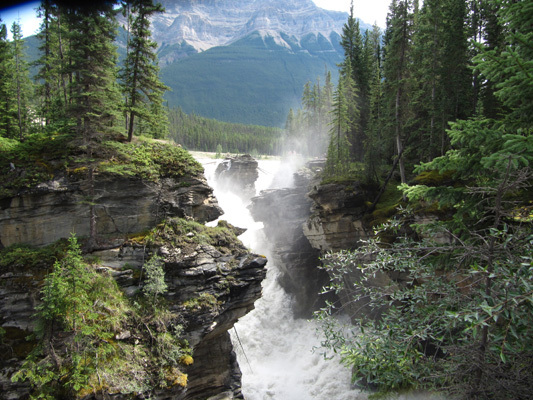 The Athabasca River originates from the Columbia Icefields and runs north to the Arctic Ocean. Here it is tearing through this limestone canyon. 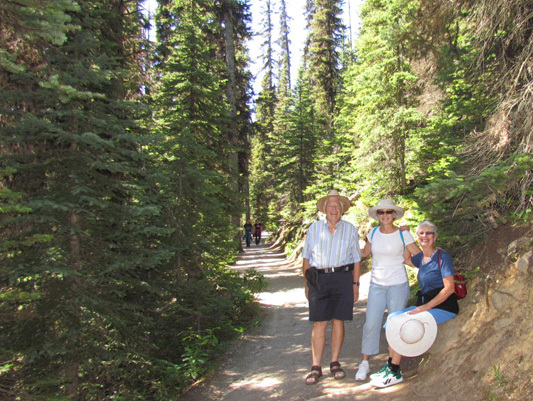 We are standing by rocks that once stood in the path of the Athabasca Falls. After a million years, it cut a new path leaving these rocks high and dry. This tram is coming down and will soon take us up Whistler Mountain--up 3,300 feet in a matter of minutes. We didn't know we were going up with 30 other people, most of who traveled here from other countries. Once the tram stopped we had another mile to the top of the mountain. Instead of following this path, we walked along the ridge and took over 200 photos, one being the photo of Glorine with Jasper in the background. On the back of Whistler Mountain, were an entire range of alpine mountains. The views were awe inspiring. 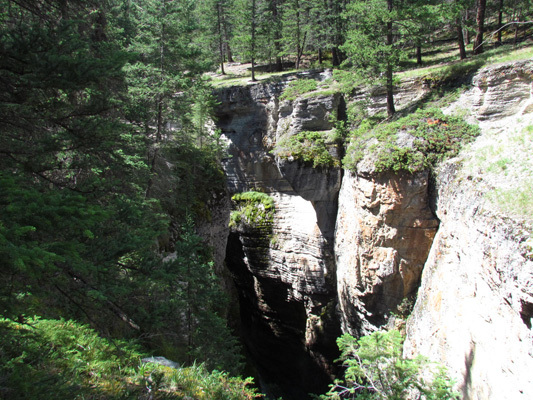 Malign Canyon (the oldest attraction in Jasper Park) is an extremely narrow water fall 150 feet deep. 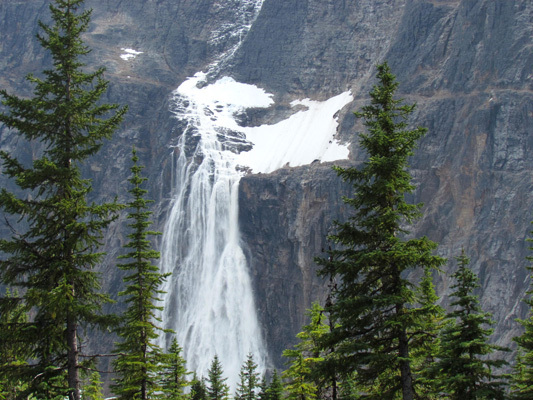 It was the most impressive water fall we have ever seen. 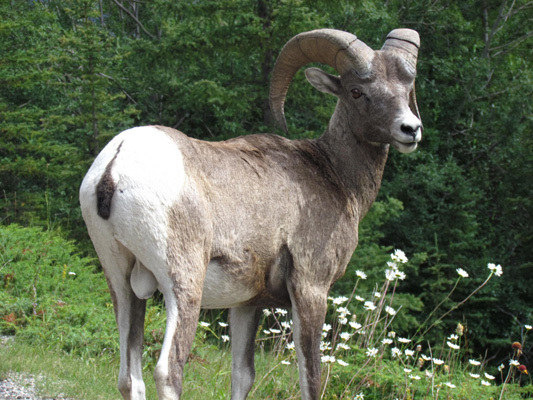 On the drive from Malign Canyon to Malign Lake, this Rockie Mountain Sheep decided to pose for pictures. So we indulged. 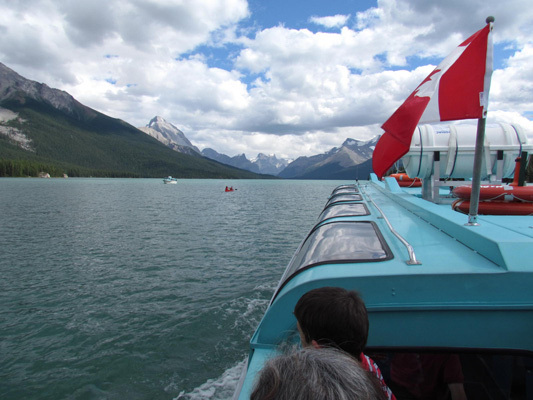 Malign Lake is the only lake in Jasper National Park that allows motorized boats, so we took a cruise. In addition to its raw beauty, we enjoy visiting with tourist from England, South Africa and Saudi Arabia. 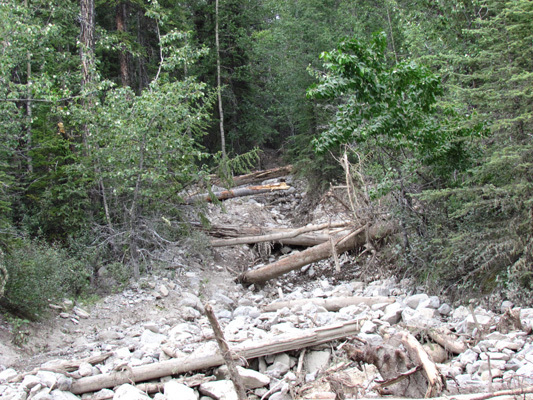 The day we arrived in Jasper a series of mud slides closed the road to Malign Lake. Thank goodness, no one was hurt. 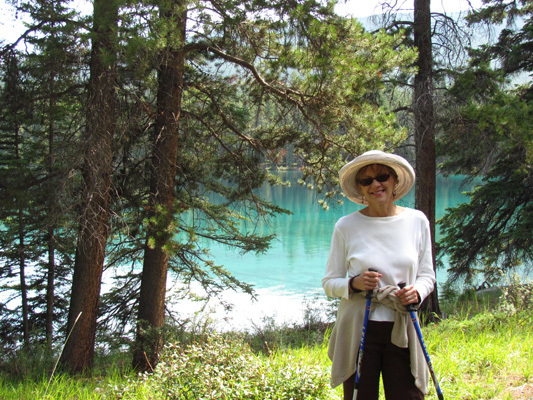 This is our last day in the Canadian Rockies so we took one more hike around one more glacier fed lake. 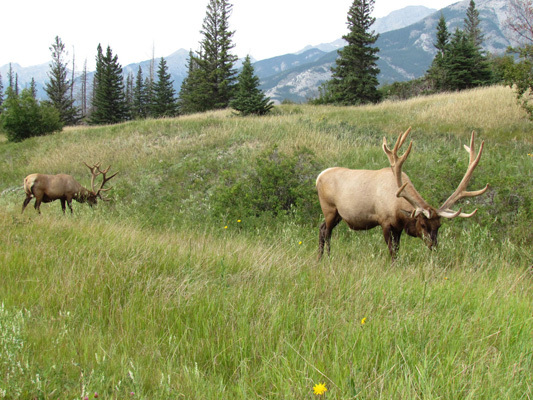 As we were leaving Jasper National Park, we saw these two Elk grazing along the road. Two 16 point Elk bucks. Awesome! 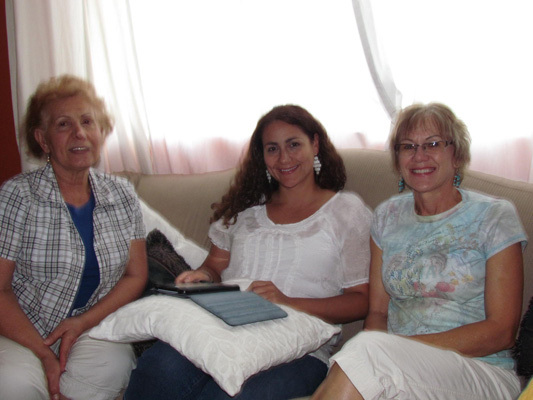 Gladys Saca is another Canadian friend from Ajijic. 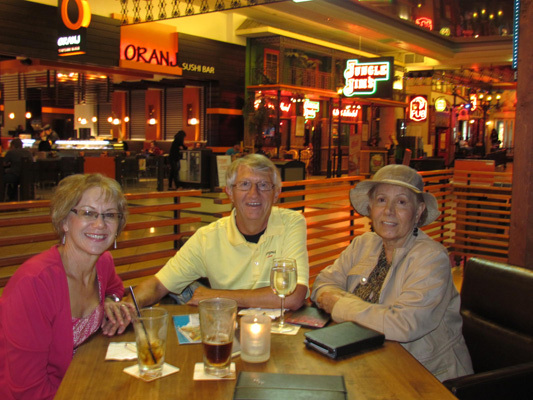 She met us on Bourbon Street at the West Edmonton Mall, at one time the largest malls in the world. 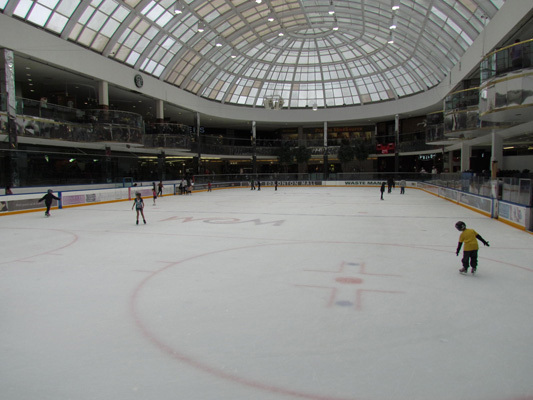 In addition to "too many" stores," the mall has an ice skating rink, that the Edmonton Oilers practice on periodically. 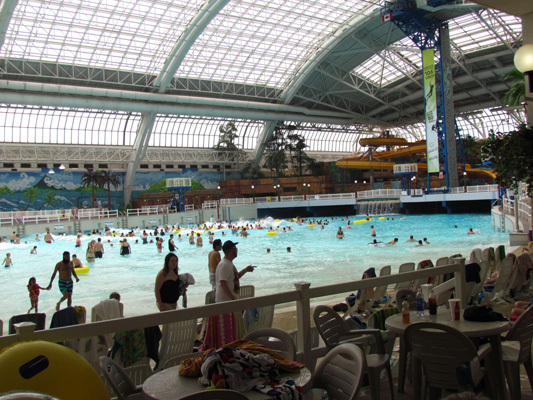 It also has this enormous wave pool, which was packed with kids and adults alike. 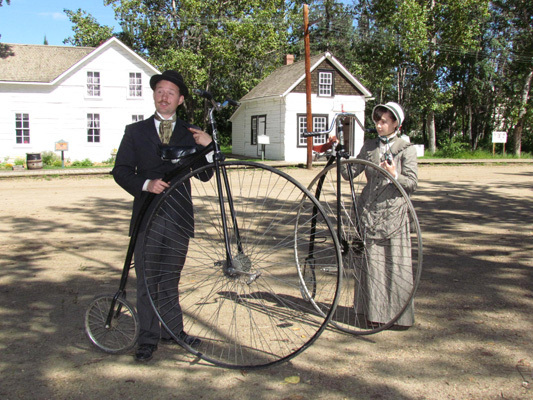 Fort Edmonton was an impressive display of an era gone by. This part of the park represents the 1880s. We did not see them ride these bikes, but these are characters from1912. 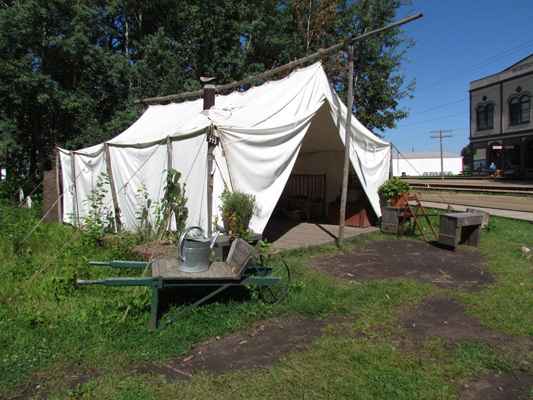 Edmonton was growing so fast during this time period (1920) that people lived in tents for up to two years waiting for homes to be built. 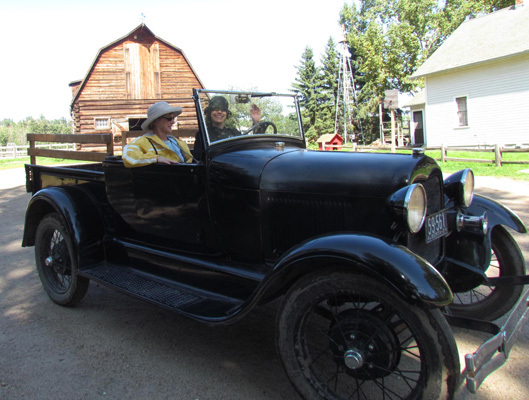 This lady from the roaring 20s took Glorine for a ride from the farm to the city. Gladys invited us over for Greek dinner in north Edmonton. Here she is with Glorine and her daughter Vanessa. We had a great time. We rode a streetcar over this High Level Bridge in downtown Edmonton. 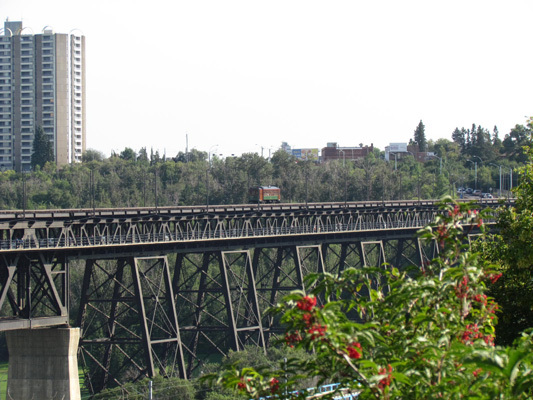 It was opened in 1913 to accommodate rail, streetcar, automobile and pedestrian traffic over the North Saskatchewan River. Theater anyone? Glorine is searching through 800 performances to see which one to attend. 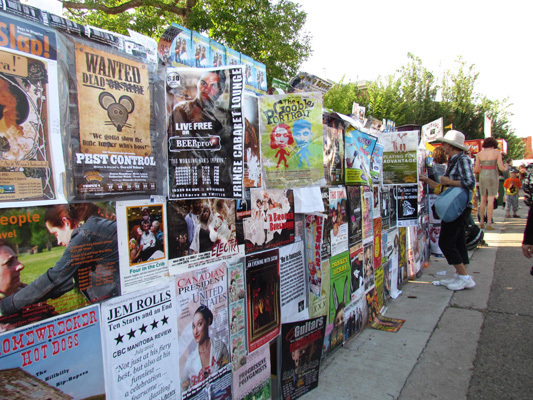 The Edmonton International Fringe Festival, which is ten days of live theater performances is the oldest and largest Fringe in North America. 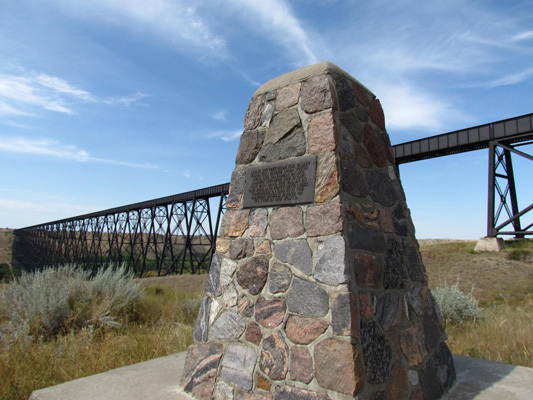 Our last stop in Canada is Lethbridge, south of Calgary. This railroad bridge is the longest and highest trestle bridge in the world stretching a mile long and over 300 feet tall. 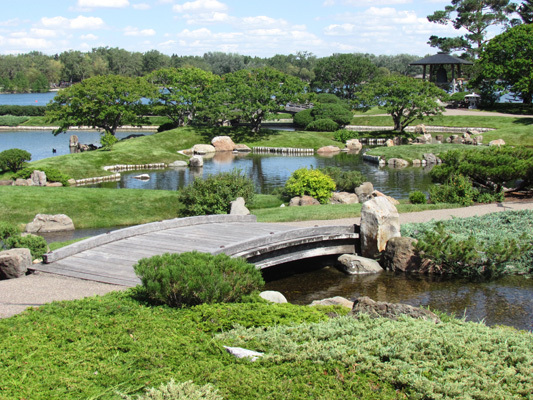 One afternoon, we strolled through the Nikka Yuko Japanese Garden in Lethbridge. The walk was a different experience than hiking up mountains. Very calm and relaxing. 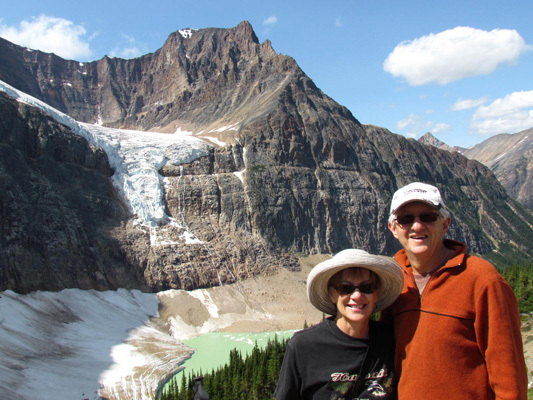 We stepped foot into all of the Canadian Rockies seven national parks. 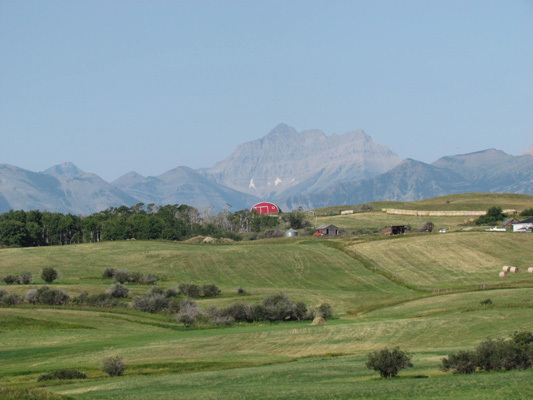 The Waterton Lakes, which is the smallest, is an extension of the prairies into the mountains. The Glacier National Park in the USA and the Waterton Park became the world's first International Peace Park in 1932. 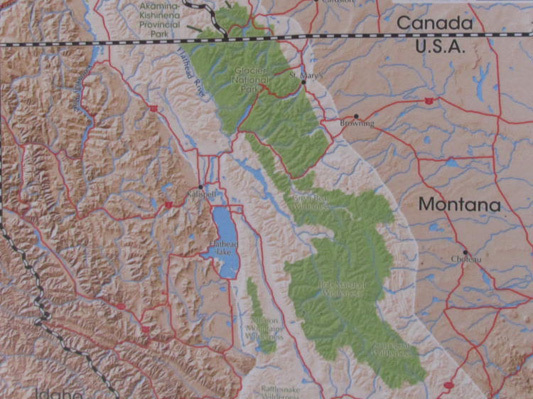 Waterton Lake has the distinction of being an International Peace Park, a UNESCO International Biosphere Reserve, and a UNESCO World Heritage Site. 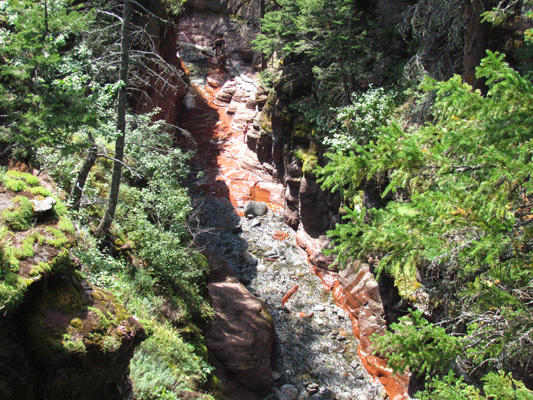 We hiked the Red Rock Canyon, which provided striking contrast between red colored bedrock and the lush green surroundings. As we were loading up for another boat cruise, we took this picture of the Prince of Wales Hotel. 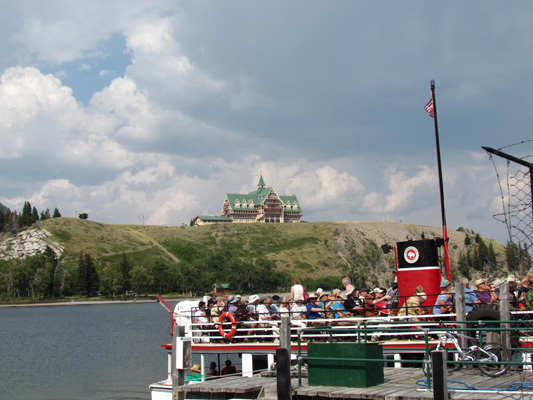 It is located on a bluff overlooking Waterton Lake. 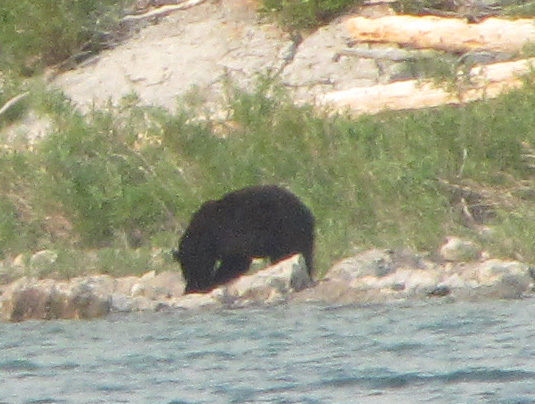 While we had seen a few black bear cubs on our Canadian adventure, this picture was our first of a bear and it was a large one. 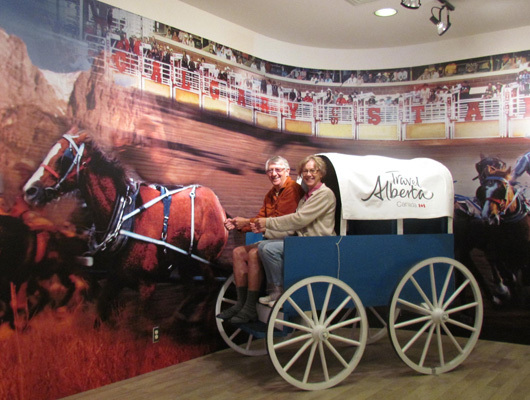 On the last day of our Western Canada adventure, we stopped at a Canadian travel information center/museum and had this picture taken. 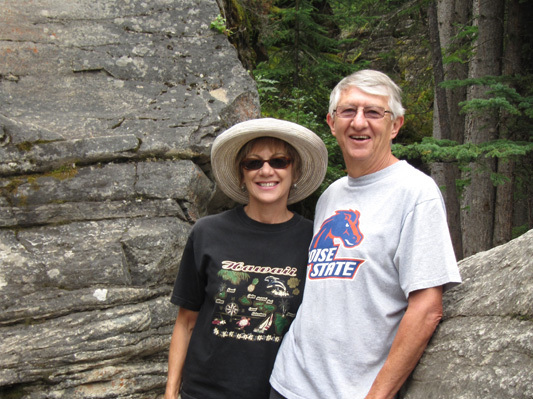 Our first stop in the USA was Great Falls, Montana. And great falls it was. 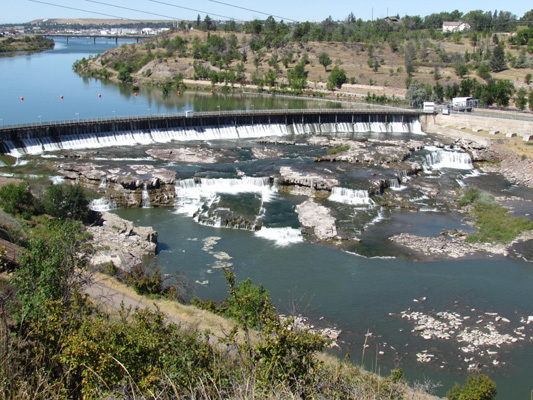 This is one of several great falls along the Missouri River. 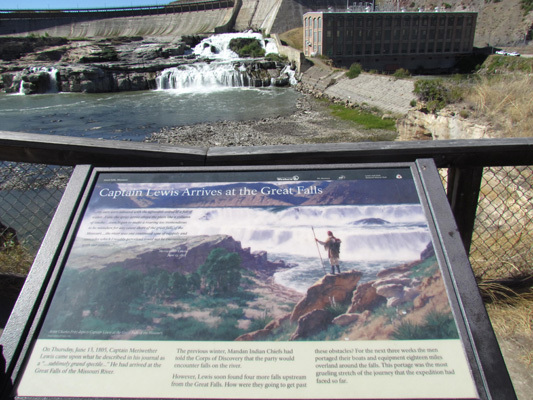 These falls became another major barrier for Lewis and Clark as they explored the Missouri River for a passage way to the Pacific Ocean. It took them a month to portage their boats and supplies 18 miles around four water falls. 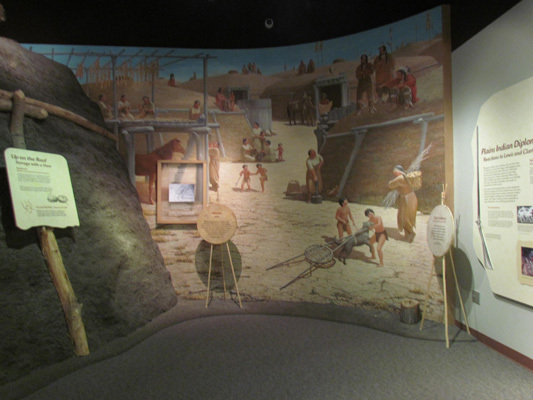 Great Falls has a Lewis and Clark Expedition Interpretive Center highlighting their adventures.